Have you ever considered that some of the bands or singers you listen to in English, might, in fact, be French? Some French singers would rather write and perform in English for personal or cultural reasons, or because they wish to reach a wider audience. Just like David Guetta, the French DJ who tours all around the world, here are 10 singers, DJs and bands who are francophone. Well known for his singles “Clandestino” and “Me Gustas Tu”, Manu Chao might be confused with a Spanish or South American singer. Yet, he was born in Paris! Thanks to his Spanish parents and their social group coming from all over Latin America, he was raised in both cultures. At the end of the 90s and beginning of 2000s, Manu Chao’s songs were a hit in France, but also in Europe and in Quebec. Nowadays, the artist is much more discreet. He stopped recording studio albums, but travels all around the world to sing in festivals. Jain was born in Toulouse, but travelled the world to follow the professional requirements of her father. She lived three years in Dubai, four years in Congo-Brazzaville and a year in Abu Dhabi. Her Madagascan origins and her various travels influenced her musical style. It allowed her to create her unique artistic and vocal sound, between pop, electronic music, reggae and music of the world. Her most successful songs are “Come” (you might have heard it in the Netflix show “Santa Clarita Diet”), “Makeba” and “Alright”. Do they really need an introduction? This French electronic music duo was formed in Paris in 1993. You might not know their faces (since they always wear robot helmets in public or on stage), but surely you know their hits “One More Time” and “Harder, Better, Faster, Stronger”. These songs could be heard everywhere at the beginning of 2000s. 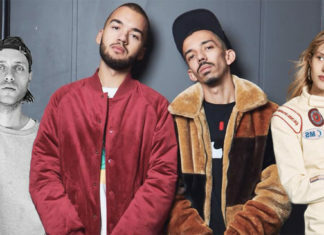 More recently, they released “Get Lucky” featuring Pharrell Williams”, and appeared on two songs from The Weeknd, “Starboy” and “I Feel It Coming”.